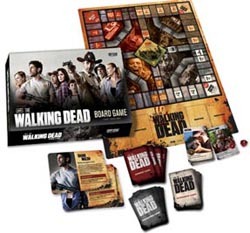 The Walking Dead Board Game – Coming Soon | We Zombie! Just in time for the second season of The Walking Dead, Crypozoic Entertainment is releasing the board game version of the series. You’ll be able to play the role of any of the survivors in the series, and if you die you get to stay in the game as a zombie and try and take out the remaining survivors. The game is going to retail for $40 and is expected to be released in September. This entry was posted in Games, Movies/Music/Audio. Bookmark the permalink.